"Our officers are not going to be asking everyone whether they have used marijuana, but if other questions lead there - or if there is a smell coming from the car, they might ask," he said. "We don't recognise that as a legal business," Mr Owen said. In a statement, CBP said that "working in or facilitating the proliferation of the legal marijuana industry in US states where it is deemed legal or Canada may affect a foreign national's admissibility to the United States". 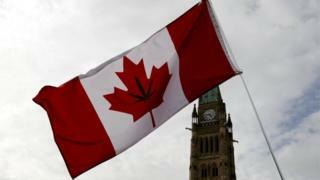 Prime Minister Justin Trudeau's government officials have maintained that despite the change in law, there is no indication marijuana legalisation will shift the US approach in how it deals with Canadians crossing the boundary, and confirmed that involvement in the industry could result in denied entry. "There's absolutely no way you can say if you've invested in the industry you're not going to be allowed into the United States," he said. Nine US states - Colorado, Washington, Oregon, Alaska, Maine, Massachusetts, Nevada, Vermont, and California - have now legalised recreational and medicinal marijuana. But the drug remains a Schedule 1 controlled substance - alongside LSD, heroin, and ecstasy - under US federal law.